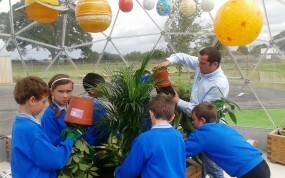 Independent and private schools use our geodesic domes for a range of curricular and extra-curricular activities. A dome can be adapted to suit a number of uses and applications to give plenty of utilisation year on year. A geodesic dome is both a stunning feature and a practical space. Unlike a traditional building extension, a dome can be sited anywhere in your grounds – even on top of a multi-storey building. Having this flexibility opens up more uses which include, science laboratories, arts and crafts, horticulture, and for more grand designs the open plan layout is ideal for social spaces, cafeterias, libraries, and even theatres. When it comes to impressing the parents of potential students, your facilities including the school’s buildings make a statement about your approach to learning and the school’s ambitions. Indeed, your school’s grounds will be the first impression they get. A geodesic dome makes an impression they won’t forget. Open Days will benefit from the extra space and give that wow factor to excite and enthuse potential parents and students. Endeavour Primary School in Hampshire has recently moved into a wonderful 21st century building, which has just been awarded the Royal Institute of British Architects award for architectural excellence. 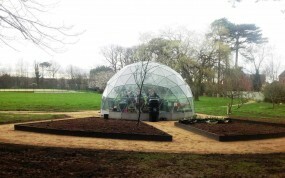 SOLARDOME® Sanctuary helps Victoria School win Eco Award for its inspiring ‘Greenspaces’ project. 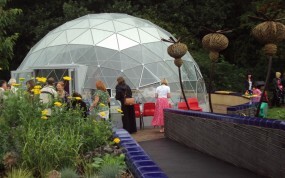 The project is an Eden-style outdoor learning space centred on a geodesic dome. A desire to deliver an outstanding level of science teaching in a stimulating educational environment led Upton Hall School to apply for a grant from The Wolfson Foundation. Our outdoor learning environment, encompassing the geodesic dome... provides a perfect facility to develop pupils’ work on environmental issues and sustainability.